300hz horn, folded would be fine. Time alignment would be rough if you are into that. Fh1, looks like a 40" horn path length, 24" x 30" mouth. "My first impression is "where did the bass go?" "
I've got FH1 - well made but my view of them = something clunky and ineffective in the way of my playing with my Karlson toys. A K12 is cooler. A K12 with pym1298 and tube on top is fun - better punch somehow than the horn rig (has to be largely a matter of balance) - its really impressive on a CD of the late Rudy Rosa's synth - and beats my Klipschorn there. If a Karlson's response is neutered - smooth by use of a stub connected to the top of its front chamber - will it lose some subjective kick ? Little K's can have way too much cavity resonance around 210Hz so such a feature might help those achieve a more reasonable balance. Two K12 plus a compact sub to 30Hz or lower could make a fun system. 200 watts per side for K12 with Kappa12a isn't too much as cone control is pretty good. harmonics and if so, does the slit vent work as a pyschoacoustic bass enhancement device? long distance builder who has very little spare time. John Inlow might have the best compromise for keeping things small. IIRC that's a stock Peavey 1504 in the FH1. 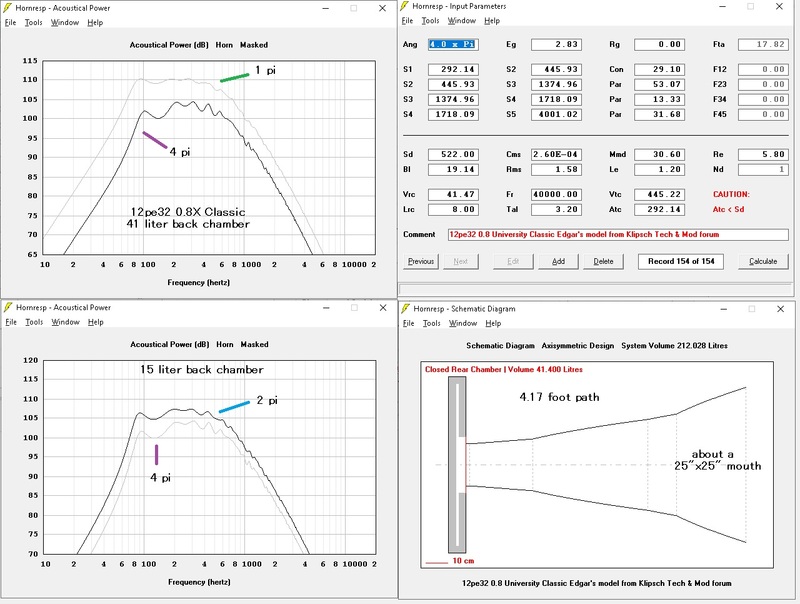 are the narrow dips around 1200Hz from the sidewall distance of ~22.5" ? Last edited by freddi; 26th March 2019 at 05:20 PM. 0.8 scaled back chamber volume would be around 40 liters - that could be tightened t reduce excursion below cutoff without much if any penalty in response. Hmm, thanks for the graphs. Whats the compression ratio in the throat ? Dual 8" b&c (low qts) would go higher, but hey, we are talking 12's !!!!! Horn looks real good, 4pi has not enough mouth, we see that. Wow 4' deep, ouch, but look at that response. Thanks for running some "old school" rules for horns. I see why djk kept to 150hz. 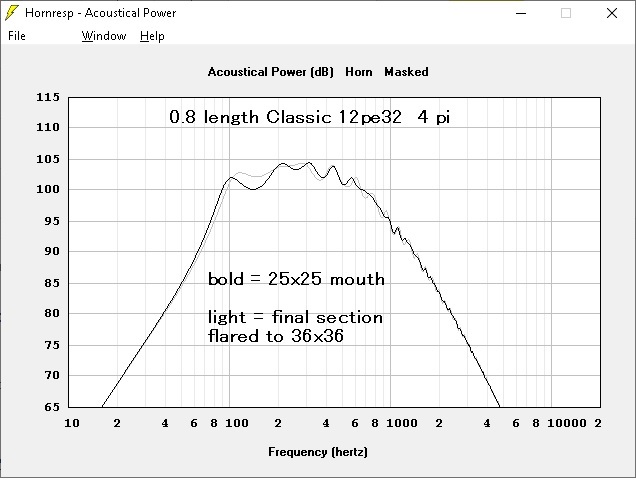 Would more mouth go flatter below 200hz in 2pi? Only djk tips i remember is lower compression ratio compression drivers, like community m200a ( 4 : 1) have a more relaxed sound. Here in post 22 he comments on lower compression ratio in avantgarde. The smallest size compression driver and horn? Maybe the compression ratio magnifies distortion. Patrick was playing with domes on horns vs compression drivers a while back. Any who, back to the tree (bass horns). Last edited by norman bates; 26th March 2019 at 06:59 PM. would such a 100Hz or so o horn augmented with a sub "potentially sound better" than some other approaches with compromised mouth size ? - or are there too many variables to consider ? I built a pair of Inlow's 135hz mid-bass horns a few years ago, single 8pe21 per horn version. I built them quick and dirty as a prototype to see if I liked them enough to build a 'final' version. Well, they were so damn good I had unfinished mid-bass horns in the living room system for a few years. They are quite remarkable in their band. I used them from ~150hz - ~600hz. And some other horns there on his site as well. I suspect the 12" version sounds equally good in it's band, but haven't built any myself. The 135hz horn isn't too long and is easier to fit into a room. I'm very lucky that I have a very large living room and can tolerate even longer mid-bass horns. So, I'm building some much larger ones at some point. Very much in the simulating and contemplating phase now, might build a very quick and dirty prototype to test in the garage late this year. I assume horn loading as low as possible would sound better through the bass guitar region. I know i just turned off 100hz crossover and I'm a little happier. 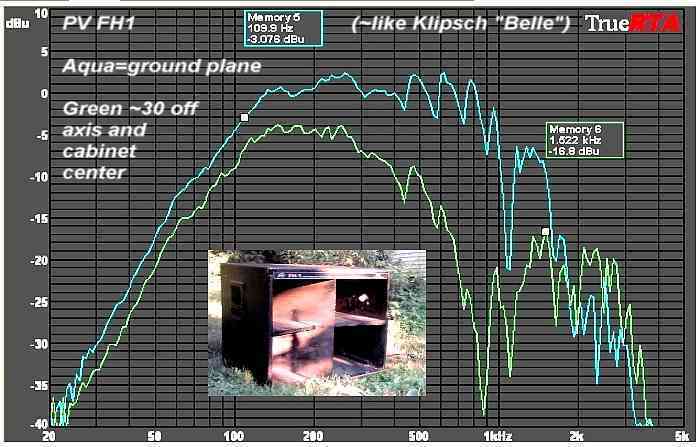 I think Inlow's 135Hz horn would scale 1.2 for my JBL M151 (might need a paper dustcap in place of its aluminum. I've wondered if it would scale to a 15, M151, 2225, etc. But headphones can't smack you in the chest like a mid-bass horn, at least none of the headphones I own can!